TB-15/30 Torch Boosters elevate gas pressure as high as 25 psi with a flow rate of 15 cubic feet per hour or 30 cubic feet per hour. TB-15 is approved for one or two torches while TB-30 is approved for up to four torches. Get more information about TB-15/TB-30 Torch Boosters. TB-60/125 Torch Boosters raise city gas pressure to 25 psi with flow rates of either 60 cubic feet per hour or 125 cubic feet per hour. TB-60 is approved for up to 12 torches and TB-125 is approved for up to 25 torches. If you do a lot of casting with large amounts of metal using a Harris melting torch with a 30N tip, or similar size torch/tip then TB-125 is the right system for a single casting torch. TB-250/500 Torch Boosters boost gas pressure to 45 psi and are high volume machines for large numbers of torches such as in a larger manufacturing facility or college training program. 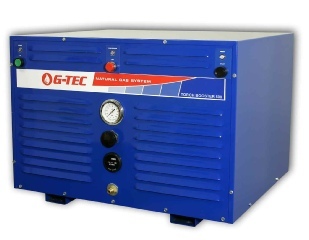 TB-250 can supply gas at 250 cubic feet per hour and TB-500 supplies gas at 500 cubic feet per hour. TB-250 is approved for up to 40 torches and TB-500 is approved for up to 75 torches. TB-250 can support 2 large casting torches; TB-500 can support 4 large casting torches. 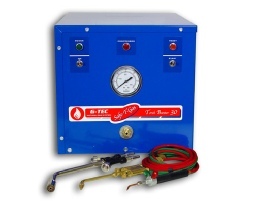 Get more information about TB-250/TB-500 Torch Boosters. 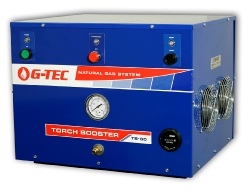 G-TEC has a Torch Booster that will supply the high-pressure natural gas service you need!